Individually wrapped whipped creme snowmen make the perfect stocking stuffer. 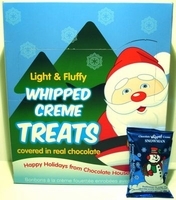 Chocolate House is known for their creamy milk chocolate treats with the whipped creme center. They also make Santa's with a whipped creme center and a Cristmas tree with a mint flavore creme. 24 Count box. Made in the U.S.A.